Posted By:Unknown | At:9:18 AM Be the first to comment! (AFP) -- Thousands of people marched in silence in New York to protest against street checks by police that rights activists say disproportionately target blacks and Hispanics. 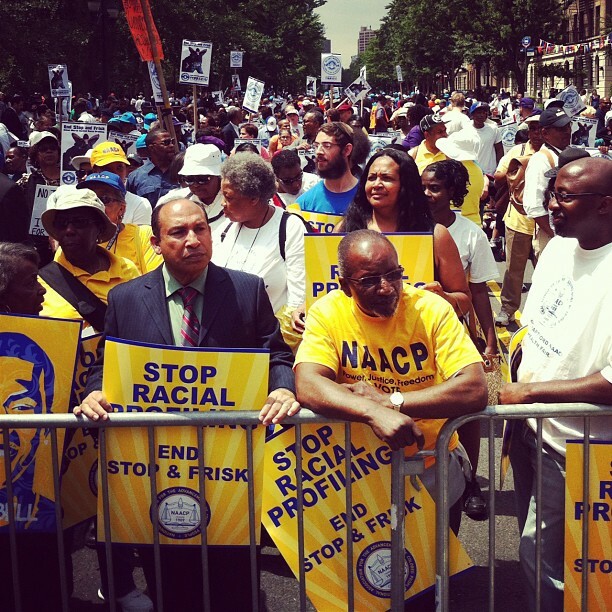 The demonstration, called by civil rights organizations, began in Harlem and moved south through Manhattan to the residence of Mayor Michael Bloomberg in Manhattan's posh Upper East Side. Among the groups that took part in the march were the National Association for the Advancement of Colored People (NAACP), the National Action Network led by the Reverend Al Sharpton and a union that represents health care workers. "End Stop and Frisks, Silent March Against Racial Profiling," said a flyer handed out by protest organizers. More than four million New Yorkers, most of them blacks and Latinos, have been stopped and questioned by police in the street since 2004, according to the American Civil Liberties Union. In 2011, the police stopped 685,724 people, 53 percent of whom were black and 34 percent Latin, a trend that has held in the first three months of this year, the ACLU said on its website. "I have been stopped and questioned by police on the corner outside my house. I don't think that happens in more powerful parts of the city," said Jose Romero, a 28-year-old Mexican immigrant. "It's not normal when people are stopped when they leave their houses to go to the store," he said. Citing police data, the ACLU said nine out of every ten persons stopped by police are found to be innocent. For his part, Bloomberg defended the street checks and insisted that neither he nor New York Police Commissioner Ray Kelly will permit abuses. "I understand why some people want us to stop making stops. Innocent people who are stopped can be treated disrespectfully, and that is just not acceptable. Commissioner Kelly won't tolerate it and neither will I," he said.